Astronomers have discovered the largest body of water so far known, a reservoir of water floating in space around a ancient distant quasar, holding 140 trillion times the mass of water in the Earth’s oceans. Remarkably enough, the find was dated as being 12 billion light years away, only 1.6 billion light years farther from the Big Bang. “Since astronomers expected water vapor to be present even in the early universe, the discovery of water is not itself a surprise,” said the Carnegie Institution in statement, one of the groups behind the findings, said. The water cloud was found to be in the central regions of a faraway quasar. 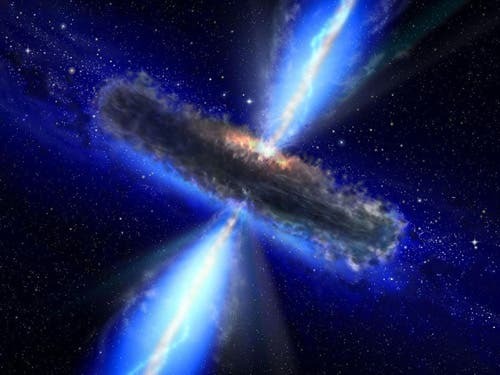 “Quasars contain massive black holes that steadily consuming a surrounding disk of gas and dust; as it eats, the quasar spews out amounts of energy,” the Institution continued in its statement. And a lot of it, I might add. Quasars are the most powerful known entities in space, with this particular one pumping out 1,000 trillion times more energy than our sun, and 65,000 times the whole of the Milky Way. The black hole found at the quasar’s center has a mass 20 billion times greater than the sun. While water vapors are known to be found through out the Universe, it’s not that common of a sight. In the Milky Way, water vapor surfaces are found only in particular regions a few light years across at most, however, the water in the distant quasar appears to be spread over hundreds of light years. The find came as part of a quasar study called “APM 08279+5255”, which gathered on observations first commenced by NASA three years ago in 2008, made using an instrument called “Z-Spec” at the California Institute of Technology’s Submillimeter Observatory. The instrument is a 33-foot (10-meter) telescope near the summit of Mauna Kea in Hawaii. “Breakthroughs are coming fast in millimeter and submillimeter technology, enabling us to study ancient galaxies caught in the act of forming stars and supermassive black holes,” says CU-Boulder associate professor Jason Glenn.